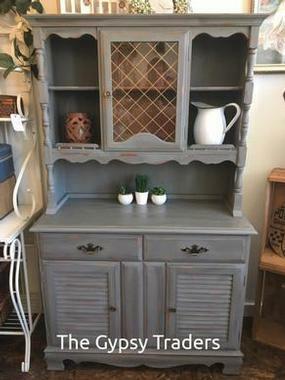 Just completed this country inspired hutch. Finished with Country Chic Cobblestone - distressed - natural and antique waxed - with poly coat on top. Two pieces. Great in a kitchen - for books in the den - extra serving pieces at the cottage. Measures 40.5" w x 18.5" d x 67" h.